Myotonic dystrophy (DM) is the most common form of inherited muscular dystrophy in adults with an incidence of 1 in 8000 in the Caucasians. The autosomal disorder affects multiple organ systems and its name is derived from the combined myopathy, dystrophy and myotonia of skeletal muscles. Myotonia, an abnormality in relaxation after muscle contraction is the primary feature of the disease along with the 'myopathic facies', and the clinical manifestation is extremely variable. DM is characterized by myotonia in conjunction with progressive weakening and wasting of skeletal muscle, mental impairment and altered creatine phosphokinase (CPK) levels. Patients may show endocrinopathies presenting with diabetes, gonadal dysfunction, infertility, cataracts, early balding, apart from cardiac conduction defects. Adequate ventilation must be maintained during surgeries and cardiac arrhythmias may be anticipated. A carefully examined patient would present typical abnormalities to aid diagnosis until obvious symptoms appear. Penetrance varies with age and the disease may affect different tissues (different organ systems) at different periods of life. Unlike other muscular myopathies, patients of DM do not show muscle hypertrophy. The patient's condition improves generally in early years but deteriorates in later childhood. The disorder is known to be caused by an increased number of (CTG) n repeats in 3'UTR of DMPK gene (GenBank X61378) on the chromosomal region 19q13.3. DM shows anticipation in families, i.e., an increase in clinical severity and an earlier age of onset in successive generations, due to inter-generational expansion of CTG repeats. Anticipation and hence increased severity of symptoms are mostly seen with maternal transmission. The array length of tandemly repeated CTGs in normal alleles is variable with a copy number of 5-37, less than 50 repeats for a pre mutation state, 50-1000 repeats in mild to classical symptom patients, and >1000 repeats in severely affected individuals and cases with congenital DM. , Number of repeats may be more in certain cell types like the muscle cells. The mechanism by which an untranslated repeat leads to the observed symptoms remains unclear. The expanded repeat may bind messenger RNA binding proteins that leads to abnormalities in the post transcriptional processing. Also immediate genes in the vicinity of the repeat tract may get affected. This study was carried out to evaluate the (CTG) n repeat expansion at the DMPK locus in individuals with clinical symptoms of muscle dystrophies. Family members of these individuals and controls from normal population were also included in the analysis. All individuals for the study were taken after obtaining informed consent and the investigation conforms to the principles outlined in the Declaration of Helsinki. One milliliter of heparinized peripheral blood sample was collected from individuals by the method approved by the Bhagwan Mahavir Medical Research Centre (BMMRC) Ethical committee. Samples were collected from eleven individuals with myopathic symptoms, their family members (n = 5), four individuals with idiopathic hypotonia, and controls taken from random population (n = 20). Detailed information (personal and family history) about the cases, along with other clinical data, was recorded in a well-designed proforma. [Table 1] gives details about some patients who participated in our study. (The age at which the patients were available for genetic testing was not always the age at which initial symptoms appeared). Clinical diagnosis was made after a thorough physical and clinical examination (tested for reflexes, gait, movement, sensation, balance, coordination, vision, hearing, myotonia by hand-shake); evaluation was done to rule out neurological causes. Cases of idiopathic hypotonia (details not shown) were those with diagnosis made before 3 years of age with unexplained hypotonia and reduced motor abilities. Genomic DNA isolation from 40 individuals was carried out from 300 μl of peripheral blood from each individual using a Mini Blood DNA isolation Kit (Pharmacia, Sweden) according to the manufacturer's instructions. Good quality genomic DNA was isolated and stored in a refrigerator (4°C). The amount of DNA obtained was ~ 10 μg per sample. The quality of DNA was checked by carrying out a polymerase chain reaction for the housekeeping gene, β-actin, as control. Approximately, ~100 ng of DNA from each sample was then amplified by PCR using specific primers for the DMPK gene encompassing the triplet repeat expansion. The forward and reverse primers DMK 1111 (5'-GGTCGGGGTCTCAGTGCATCCA-3') and DMK 9003 (5'- CACAGGGCTGAAGTGGCAGTTCCA-3') amplifying a 2.1 kb target were used for PCR. Each 50 μl reaction mix consisted of 1x PCR buffer (QIAGEN), 1x Q-solution (QIAGEN), 1 μl MgCl 2 (25 mM) (Applied Biosystems), 0.2 mM each of dNTPs, 0.1 μM of each primer, and 2.5 U of Taq DNA Polymerase (QIAGEN, Cat.No.201203). The PCR protocol used was initial denaturation at 95°C for 5 minutes followed by 94°C for 30 sec, 66°C for 2 min; 72°C for 2 min, run for 35 cycles with a final extension of 72°C for 7 min. Seven microliters of PCR reaction mix was electrophoresed on 0.8% agarose gels stained with ethidium bromide. A 1 kb DNA ladder was used to identify the molecular weight of the bands visualized on the gel. The image was captured on an Alphatec Gel Doc Imager System (USA) and analyzed using the Chemi Imager software version 5.5. All the 20 control samples, 2/4 cases with idiopathic hypotonia, 6/11 cases of muscular myopathy and 3/5 family members (1/5 poor sample quality) of the affected individuals showed a PCR product of 2.1 kb corresponding to the normal allelic band. The 2.1 kb target encompasses the CTG repeat sequences (up to 35 repeats). The blood lymphocytes of two of the 11 cases of myopathy showed a normal allelic band and an expansion yielding a larger band of 8 kb (#7) and 3.2 kb (#8) respectively. Band density analysis showed 45% of the patient's blood lymphocytes with the expanded 8 kb fragment and 37% of the blood lymphocytes with the 3.2 kb fragment. The DNA isolated from the blood of the third patient (#6) of the 11 cases of myopathy gave a normal 2.1 kb band, however DNA isolated from muscle biopsy material showed an expanded 4.3 kb fragment. 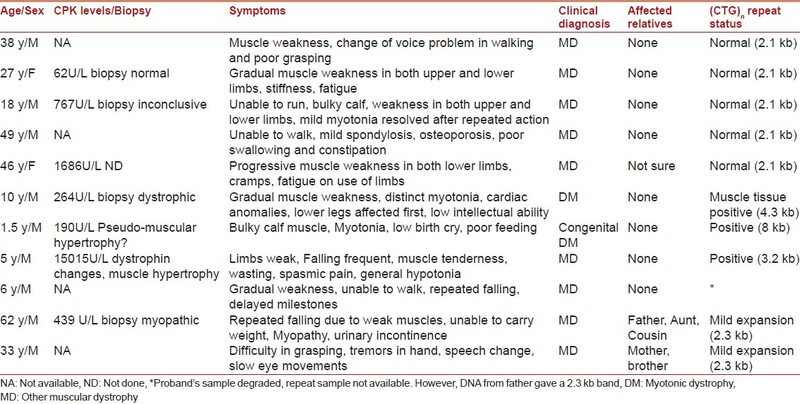 A 2.3 kb band corresponding to an expansion of ~ 66 repeats was seen in five individuals which included two adults affected with muscular dystrophy (#10 and #11), two individuals with idiopathic hypotonia (not shown), and the father (symptomatic) of a muscular dystrophy patient (#9) [Table 1]. Myotonic dystrophy (DM) is a trinucleotide repeat expansion disorder involving repeats in the non-coding region of the DMPK gene. Non-coding repeat disorders are primarily multisystem disorders involving the dysfunction/degeneration of different tissues at various levels. The expanded repeat is both meiotically and mitotically unstable and the size of the repeat correlates broadly but not absolutely with symptom severity. Although simple repeats compose a substantial fraction of the eukaryotic genome, the mechanism(s) by which these triplet repeats lead to the complex symptomatology in DM remains controversial. Trinucleotide repeats are generally thought to expand during DNA replication in multiplying cells or an alternate mechanism could be that the expansion occurred during DNA repair in non-multiplying cells. Variability in the phenotypes of the disorder is considered to be due to the somatic heterogeneity in the non-coding repeat tracts. A characteristic of DM is the transient increase in muscle tone elicited by use of the muscle, along with the facial changes and multisystem involvement unlike in other muscular myopathies. Fatigue was a common feature that all our cases shared. Severity of myopathic symptoms like progressive muscle weakness and wasting, cramped limbs, stiffness, spasms, slurring of speech etc., in the present patient group spanned from mild to severe. Using genomic PCR, we were able to evaluate the repeat status and confirm the clinical diagnosis of DM in two of the 11 cases showing myopathic symptoms; one of them being a case of congenital DM (#7). Along with a normal 2.1 kb allele, the congenital DM showed an expansion of ~ 2000 repeats. An interesting observation in the other DM case (#6) was that DNA isolated from blood lymphocytes gave a normal 2.1 kb amplicon; since muscle biopsy was available at that time, we isolated DNA from the muscle tissue and PCR performed with the DMPK primers revealed a 4.3 kb fragment indicative of an expanded CTG tract (expansion of <1000 repeats). It is known that CTG repeat tract is mitotically unstable leading to somatic mosaicism for the repeat length as was seen in case 6. The patient showed distinct hand myotonia and distal muscles were involved before the proximal. In the case of patient #3, DM was considered a possibility, however, there was no CTG repeat expansion seen. Cases # 10 and 11 had a family history of muscle-related problems, and both the samples gave an expanded CTG tract (2.3 kb) of the DMPK gene. The sample from another 6 year old child (#9) diagnosed with a muscular dystrophy was not analyzable; however, DNA isolated from the father of the child, upon PCR for evaluating the CTG repeats, showed an expanded allele of ~ 66 repeats. The father of this child was mildly symptomatic showing reduced intellectual abilities apart from general weakness. Case #8 had very high CPK values, progressive weakening with generalized hypotonia, no other organ system involvement; tissue biopsy revealed muscular hypertrophy and molecular analysis revealed a > 1000 repeat expansion that probably contributed to the progression. DMPK protein is predicted to have several functions based on putative substrates and interacting proteins, including the modulation of skeletal muscle sodium channels, Ca2 + homeostasis,  RNA metabolism and cell stress response. DMPK protein may be involved in communications within cells especially of the heart, brain and skeletal muscles. It is known to switch off a specific sub-unit of the myosin phosphatase gene which is important for muscle tensing. The CTG repeat could directly alter DMPK protein levels by interfering with DMPK transcription as well as affect the chromatin configuration, thereby affecting the expression of neighboring genes like DMAHP/SIX5 also known to be involved in muscle function. , The expanded CTG repeats could indirectly affect by altering the transcription of other genes by sequestering RNA-binding proteins/nuclear factors required for their proper expression. Muscle development and maintenance is thereby affected by altered transcription/translation of either single or multiple tissue-specific RNA(s). Rarely, defects of genes coding for dystrophin associated glycoproteins cause peripheral myopathies and cardiomyopathies. Giving this kind of a role, the repeat expansion in the DMPK gene may as well be affecting its function in other muscular conditions other than DM. Relatives of those involved in the study were offered molecular genetic testing for triplet repeat expansion, especially for the cases with diagnosis of DM to allow the treatment of any cardiac conditions, pick early cataract, diabetes etc., These patients were suggested to undergo yearly ECG and to practice pulmonary hygiene. To gain increased insight into the presenting disorder, we highlight here that expansions at the triplet repeat tract in the DMPK locus may be evaluated in individuals clinically diagnosed with muscular myopathy as well as hypotonia, without limiting this test to only those patients with characteristic clinical symptoms of DM. 1. Eriksson M, Ansved T, Edstrom L, Anvret M, Carey N. Simultaneous analysis of expression of three mytonic dystrophy locus genes in adult skeletal muscle samples: The CTG expansion correlates inversely with DMPK and 59 expression levels, but not DMAHP levels. Hum Mol Genet 1999;8:1053-60. 2. Wald NJ, Law MR. Serum cholesterol and ischaemic heart disease. Atherosclerosis 1995;118:S1-5. 3. Fu YH, Pizutti A, Fenwick RG, King J Jr, Rajanrayan S, Dunne PW, et al. An unstable triplet repeat in a gene related to myotonic dystrophy. Science 1992;255:1256-8. 4. Harper PS, Harely HG, Reardon W, Shaw DJ. Anticipation in myotonic dystrophy: New light on an old problem. Am J Hum Genet 1992;51:10-6. 5. Harper PS. Major Problems in Neurology: Myotonic Dystrophy. London, UK: WB Saunders; 2001. 6. Lu X, Timchenko NA, Timchenko LT. Cardiac elav-type RNA-binding protein (ETR-3) binds to RNA CUG repeats expanded in myotonic dystrophy. Hum Mol Genet 1999;8:53-60. 7. Martorell L, Cobo AM, Baiget M, Naudó M, Poza JJ, Parra J. Prenatal diagnosis in myotonic dystrophy type 1. Thirteen years of experience: implications for reproductive counselling in DM1 families. Prenat Diagn 2007;27:68-72. 8. Cheng S, Barcel JM, Korneluk RG. Characterization of large CTG repeat expansions in Myotonic Dystrophy alleles using PCR. Hum Mutat 1996;7:304-10. 9. Cummings CJ, Zoghbi HY. Fourteen and counting: unraveling trinucleotide repeat diseases. Hum Mol Genet 2000;9:909-16. 10. Ozawa E, Noguchi S, Mizuo Y, Hagiwara Y, Yoshida M. From dystrophinopathy to sarcoglycanopathy: Evolution of a concept of muscular dystrophy. Muscle Nerve 1998;21:421-38. 11. Otten AD, Tapscott SJ. Triplet repeat expansion in myotonic dystrophy alters the adjacent chromatin structure. Proc Natl Acad Sci U S A 1995;92:5465-9. 12. Thornton CA, Wymer JP, Simmons Z, McClain C, Moxley RT. Expansion of the myotonic dystrophy CTG repeat reduces expression of the flanking DMAHP gene. Nature Genet 1997;16:407-9. 13. Alwazzan M, Newman E, Hamshere MG, Brook JD. Myotonic dystrophy is associated with a reduced level of RNA from the DMWD allele adjacent to the expanded repeat. Hum Mol Genet 1999;8:1491-7. 14. Kinoshita M, Komori T, Ohtake T, Takahashi R, Nagasawa R, Hirose K. Abnormal calcium metabolism in myotonic dystrophy as shown by the Ellsworth-Howard test and its relation to CG triplet repeat length. J Neurol 1997;244:613-22.